Project Restore's main activity is helping to produce and distribute topical religious magazines. Most of our magazines can be viewed online by clicking on the "Give-Away Library" link below. Mission statement: Project Restore exists to proclaim the love and justice of God in the setting of the cosmic conflict between good and evil. The resources put into our hands are used to proclaim the Gospel of Jesus Christ and encourage people to become His disciples. Further we call His followers to ever higher standards of conduct to please and bring glory to Him, which also rewards His followers with a more abundant life. Project Restore works with folks interested in getting quantities of the magazines (or flyers) shown on this web site and with folks interested in bulk mailing them to selected zip codes. If you would like more information on either of these options, or you have a question or comment, please contact us for more information. 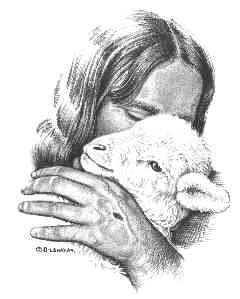 Copyright(c) Project Restore, Inc. (Jesus and Lamb drawing), P.O. Box 2000, Locust Dale, VA 22948. Project Restore, Inc. is a 501(c)(3) nonprofit organization.